Samsung may not be planning to launch the Galaxy S8 at this year’s Mobile World Congress in Barcelona, but it is going to showcase four new virtual and augmented reality experiences. The projects are coming from Samsung’s Creative Lab, an internal program that encourages Samsung employees to pursue and develop creative and innovative ideas across all areas of the business. The VR and AR experiences will be exhibited at 4 Years From Now, a platform at MWC which allows startup businesses with the potential to exhibit at the 2021 show to present to and connect with potential investors. The four VR and AR products Samsung has in its future are a smart aid for visually impaired people, monitorless PC viewing glasses, a VR home-furnishing solution and a 360-degree travel experience platform. Relúmĭno is the smart aid intended to help the visually impaired watch TV without the need for expensive visual aids. It works with Samsung’s Gear VR and enables them them to read books and watch TV with more clarity than they’d have otherwise. 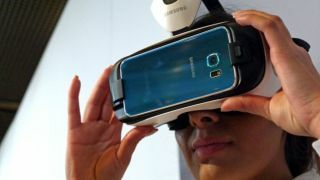 It works by using a mobile app which, when inserted into the Gear VR, can enhance the quality of visuals and even text on screen. Not only that, it can remap blind spots by displacing images and can correct distorted images caused by metamorphopsia using an Amlser grid. Monitorless is a solution that uses a combination of VR and AR to enable users to use their smartphones and PCs without a monitor. It works by using a pair of glasses that resemble a regular pair of sunglasses to view the content on the device. The final solutions are intended to help consumers make informed decisions before making large purchases in the areas of home and travel. We’ve already seen IKEA successfully use VR as a platform for kitchen decoration planning. Now Samsung is expanding on that with VuildUs, a program that will enable users to see what a new piece of furniture would look like to scale in their home before they buy, negating the need to measure every part of your home before redecorating. VuildUs uses a 360-degree depth camera and a mobile app for VR headsets. Users scan their home using the camera and transfer the data to the mobile app where it’s used to build a VR version of their home. This will allow the user to pop on their VR headset and enter a virtual version of their home where they’ll be able to view items of furniture in 3D, and even buy immediately if they’re happy with it. TraVRer is a 360-degree video platform that’s intended to give users a peek at a prospective holiday before they go, or even after they come home if they’d like to reminisce. The platform allows you to visit famous landmarks and places around the world, with the mood and noises of the location captured to help you feel like you’re really there. You can switch between different videos to go in different directions, or see a location at different times of day to make sure it’s the place for you before you commit to flying there. It’s interesting to see how Samsung is planning to take VR and AR technology forward and it gives a real insight into how businesses are planning to make use of the platforms to benefit consumers outside of the realm of gaming.